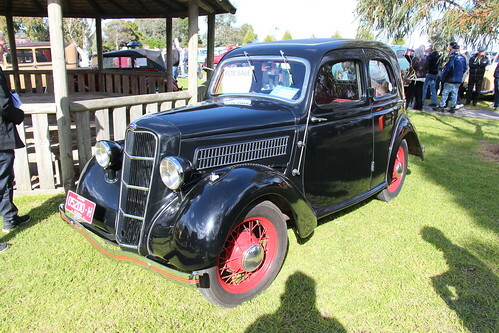 The 1932-37 Model Y (or Ford 8) was the first of the small English Fords, its grille very similar styling to the American 1933 and 34 Fords. Updated in 1938 by the 7Y with a new shape radiator grille, styling unique to the UK, rounding back at the top. The 7Y leading to the first Anglia, the E04A in 1939. Engine; 8hp 933cc 4 cyl sidevalve. Introduced in 1934, was the slightly larger and more powerful Ford Model C (or Ford 10), with a grille similar to the 1935 American Fords. Engine; 10-30hp 1172cc 4 cyl sidevalve. Replaced in 1937 with the Ford 7W, same engine as the Model C, shape of the grille similar to the 7Y, leading to the first Prefect, the E93A in 1938.